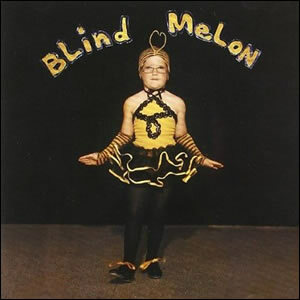 Blind Melon is the 1992 debut album by the rock band of the same name. The album was an international seller due primarily to the breakthrough hit “No Rain” along with a few other minor hits. With producer Rick Parashar, the band approached production of the album to be intentionally devoid of any digital effects or any 1990’s production techniques in an attempt to make a “classic” sounding record. This extended to the use of out-of-date amplifiers and instrumentation. The results were mixed with some tracks enhanced by the “vintage” sound and others just sounding muddled and under-developed. Although often mis-labeled as a “Seattle” band, the album was merely recorded in Seattle. The band itself was formed in Los Angeles and made up of personnel from the South and Midwest. Blind Melon came together in 1990 when vocalist Shannon Hoon, an Indiana native met guitarist Rogers Stevens and bassist Brad Smith, both from Mississippi. Stevens and Smith eventually persuaded fellow-Mississippi drummer Glen Graham to come to L.A. and a second guitarist, Christopher Thorn rounded out the quintet. Although the band’s rise in L.A. was rather rapid, they were signed to Capitol Records in 1991, they eventually decided that they did not “fit in” with that scene and relocated to Chapel Hill, North Carolina where they were able to rent a house big enough for them and their equipment and work on new material for their first album. The iconic cover art is based on a 1975 photograph of Graham’s younger sister in an awkward bee costume and was carried through for the band’s videos which used a modern day actor who resembled the younger Graham. “I Wonder” adds a lot of diverse parts, starting with an acoustic intro and winding through several riff-driven sections. There is a sense of hesitation and under-development as the players appear to follow Hoon through the various changes. This begins a section of the album where Blind Melon seems to be on the brink of making strong and interesting rock music but had not allow the time for the songs to properly ripen. “Paper Scratcher” and “Dear Ol Dad” illustrate this perfectly, with the only real highlight being the acoustic lead by Stevens. The heart of the album is two back-to-back songs in the middle. “Change” is the first of these, a nice acoustic ballad with brilliant harmonica and mandolin overtones by Thorn. It is a coming-of-age song with poetic lyrics and fine performances by everyone, showing that this band definitly had potential to develop into a top-notch act. The other great song on the album is, of course, “No Rain”, by far the most popular song by the band. Although its popularity was fueled by the brilliant MTV video that depicts a bee girl trying to find her niche in the world, the musical credentials of the song itself make it an entertaining and timeless classic decades later. It contains a most unusual arrangement where Stevens’ lead and Thorn’s acoustic are given’ prime attention with just sparse rhythm intervening mostly for effect. This all adds as a perfect canvas for Hoon’s fantastic vocals, unmistakably clear and present and a bright signpost along the highway that is 1990’s music. Unfortunately, the album really falls off and these highlights, with the final six tracks not adding much in terms of originality or entertainment that is not already present earlier on the album. Of these, only the closer “Time’ offers much in way of ambition, as the band attempts to summarize the themes of the previous twelve tracks to end the album. Like many rock band’s Blind Melon‘s turn at fame was meteoric and cut short tragically. Shortly after releasing the band’s follow-up album Soup in 1995, lead singer Shannon Hoon died of a drug overdose, abruptly ending the band’s rise.